Three stone engagement rings, or diamond trilogy rings as they are also known, are rich in symbolism. One diamond is said to represent the present, the second diamond representing the past and the last diamond representing the future. Diamond trilogy rings offer a wide variety of design possibilities depending on the shape of the chosen diamonds and the style of setting. Ranging from classic designs with three claw set Round Brilliant diamonds to bezel set fancy cut diamonds, three stone engagement rings can be created as timeless, classic designs or bold, contemporary rings. A popular option for 3 stone engagement rings is to use coloured gemstones as accents to the central diamond, or have diamonds set on either side of a central coloured gemstone. Other options include using one style of diamond cut in the centre, flanked by two cuts of another style, such as a Round Brilliant diamond with two Pear shaped diamonds. The options are limited only by your imagination! This style of ring can also be created with any size and shape of diamonds. The centre diamond can be larger than the other two diamonds, or all the diamonds can be the same size, depending on the style of ring you are aiming to achieve. Our jewellers can help you to choose the diamonds or gemstones to create the perfect three stone engagement ring. 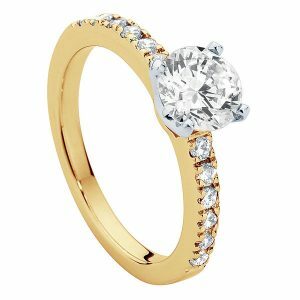 Larsen Jewellery specialises in custom made engagement rings, including diamond trilogy rings. As we make all of our rings to order, your choice of design is not limited to the selection shown above. All the diamond ring designs shown on our website can be made with your choice of diamond, picked from a selection of loose diamonds, and in any metal, including White Gold, Yellow Gold and Platinum. Whether you want to choose from one of our classic styles, or create something completely unique, Larsen Jewellery can make a three stone engagement ring to suit any style and budget. You can use our many display rings to help you choose a style, or alternatively, you can bring in your own ideas or pictures and our jewellers can help you design something special and truly unique. 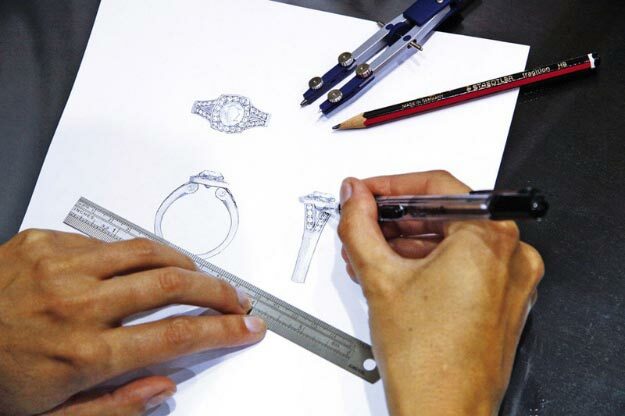 We welcome you to come in for an obligation-free design appointment with one of our jewellers who can advise you on choosing a trilogy ring design to suit your individual style. We can also help you understand the 4 C’s of diamonds to ensure that you make an informed decision when choosing your diamond or coloured gemstone for your three stone engagement ring.